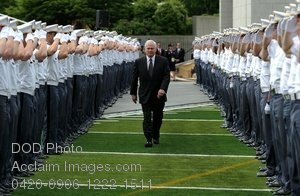 Description: Underclassmen salute Secretary of Defense Robert M. Gates as he arrives for a commencement ceremony at the U.S. Military Academy at West Point, N.Y., May 23, 2009. Gates attended the ceremony to present the graduates with their diplomas. (DoD photo by Master Sgt. Jerry Morrison, U.S. Air Force). Stock photography by Department of Defense Public Domain.